Though he seems to be straight from 1963, this guy actually appeared in 1993. Maybe he missed the bus. 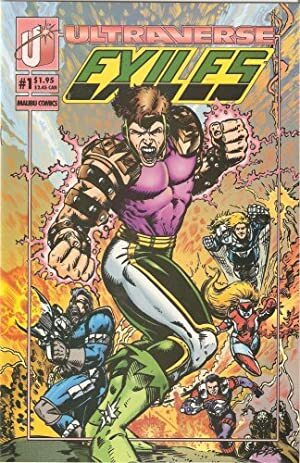 He was in the early issues of Malibu Comics’ Exiles. For more context about the Exiles, see Dr. Deming’s character profile. Group Affiliation: Operative for Max Kort. Height: 7’5” Weight: About 800 lbs. Tostovitch is an enormous, very muscular and athletic man. It is likely that his size and musculature were enhanced, which is reminiscent of Boris Bullski. He’s a well-trained fighter and operative. 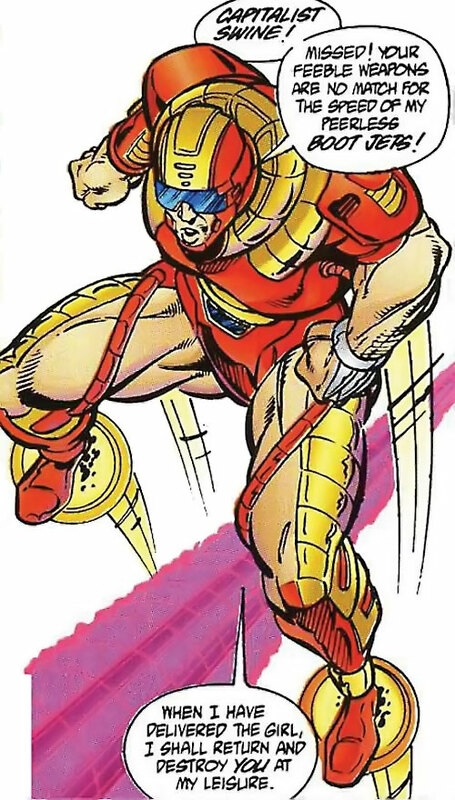 His armoured costume includes an exoskeleton further increasing his strength, wrist repulsors and boot jets. 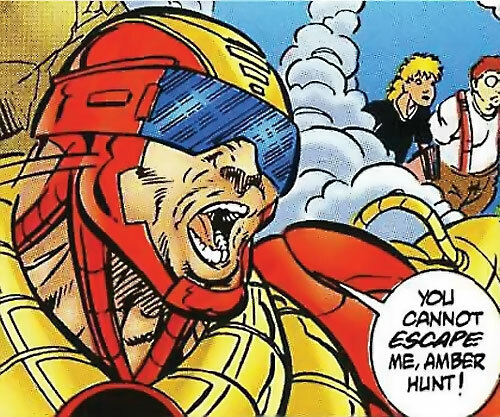 It’s a sort of super-light Iron Man suit. Apparently, Kort would frequently detail a few Cybernoids to operate along with the Soviet. Tostovitch used to be an agent of the KGB, possibly with minor physical enhancements. After the 1991 coup, he found himself in hot water and with his political enemies on the rise. He was forced to flee. Tostovitch stole a prototype battlesuit on his way out to facilitate his new career as an international mercenary. As “Supreme Soviet”, he came to work for American millionaire Max Kort. Tostovitch thus hunted victims of the Theta virus with the potential to acquire superhuman powers. He had a few encounters with the Exiles, a group with similar objectives. Though the individual Exiles were no match for him, they did spirit away a promising subject, college student Amber Hunt, before Tostovitch could kidnap her. Angered by this failure, Kort used Tostovitch for an off-the-cuff experiment, to see what would happen if a person not infected by the Theta virus was subjected to the Deming process. Though he developed even greater strength and size for a few seconds, the Russian was reduced to a skeleton by the treatment seconds later. According to Steve Gerber’s notes, the Supreme Soviet was 6’6” and 275 lbs. But he was drawn as being even taller and larger than that – a giant. 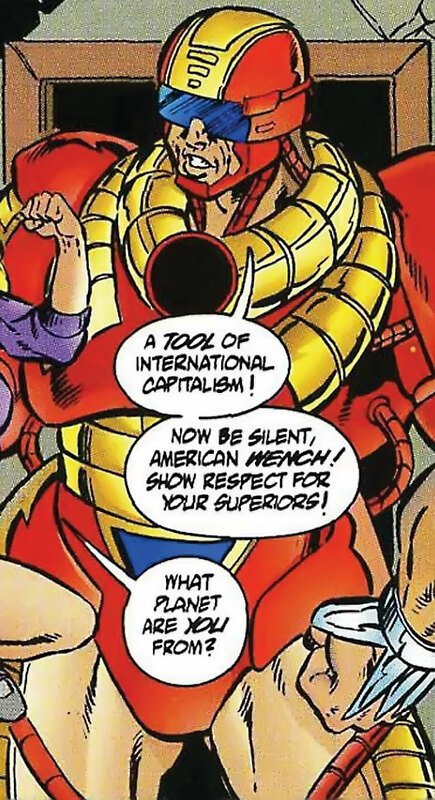 The notes describe the Soviet as non-superpowered, but it’s doubtful whether that’s still the case in the published material. Given the writer’s description, one also gets the impression that the costume was supposed to be actual armour, covering Tostovitch’s body. Perhaps the flesh-coloured area were meant to be coloured silver ? Caricature threatening Communist soldier using Cold War jargon. Tostovitch apparently hoped to get rich enough to finance a counter-coup and restore the USSR. ARMOUR [/STR/ 08 /BODY/ 07, Energy blast: 08, Flight: 05, Shade (Aural, visual): 02].